Welcome to John Bannon's 'Sizzle' - an absolute tour-de-force of a packet trick. A jaw dropping SIX phases, it amazes the audience all the way up to an ending so impossible, so utterly unexpected that people may well faint. SIZZLE - You show a packet of cards consisting of three red backed Jokers and an Ace Of Spades. One of the red backed Jokers from this group is set aside, and replaced with a blue backed Joker. Instantly the other red backed Jokers magically change colour to match the blue stranger. Then one of the blue backed jokers is removed and replaced with a green backed Joker; the other Jokers in the packet turn green as well. Impossibly this happens a third time as a purple Joker turns the packet purple. The Ace Of Spades is then removed and shown to have an ORANGE back design. Even more incredibly when the packet of Jokers is spread out it shows that every card now has a different colour back. This bewildering and jaw dropping series of visual changes will leave any audience shellshocked... and then you hit them with the motherload. The packet of Jokers is flipped face up to show that every card has changed leaving you with A ROYAL FLUSH IN SPADES! 'Sizzle' is a steroid stuffed version of Alex Elmsley's 'Dazzle' - a routine considered by many to be the greatest packet trick of all time. John Bannon has taken Dazzle to a whole new level. 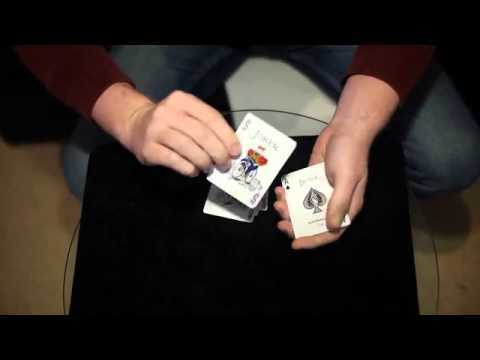 Using just the nine playing cards (provided) you will be able to show an incredible amount of magic. The routine is easy to do (using only simple moves) and ends with a mind melting climax. For more magic by John Bannon click here.